UNITED NATIONS, December 8 -- After five days of negotiations, the UN Security Council at 6:30 Wednesday night agreed to a Press Statement, in light of ECOWAS recognition of Alassane Ouattara as the winner of Cote d'Ivoire's election. The Statement also deplores the suspension of non governmental media in Cote d'Ivoire. Inner City Press has heard that the US urged SRSG Choi to declare Ouattara the winner, even before the Constitutional Council had made its statement - out of order. Inner City Press asked African Ambassadors for their views as they left the Council chamber. “We wanted the Security Council to support Africans' decisions,” Ambassador Rugunda of Uganda told Inner City Press. Russia had held out -- several sources told Inner City Press that China supported Russia too. Chinese Ambassador Li Baodong told Inner City Press that the two parties should share. 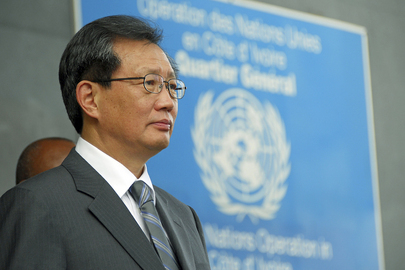 UN SRSG Choi: he's said he'll stay for legislative elections. Will he? With US Permanent Representative Susan Rice in Washington, Brooke Anderson was picked to read out the press statement. It was long, and Ambassador Anderson walked away from the microphone as Inner City Press asked, "Why did this take so long?" While the US was reticent to explain, they pointed to elements in the text finally agreed, for example the section on free press, and mostly the inclusion of Ouattara's name. Something, they say, was accomplished. But what about the bombings in Sudan? The US Mission has still not answered questions put to it last week and on Tuesday about murder and bombings in Sudan, including a call by the SPLM for a Security Council investigation... But that (apparently) is for another day.